Tucker, man, you killed him! 4th witness — Tom Wade col. Evidence same as the others. See below. 5th witness — Jim English col. Evidence about same. See below. William Hines — I cannot identify this William Hines, who is not the same man as the barber and hospital administrator. Mattie Lewis — possibly, in the 1900 census of Wilson, Wilson County: Mattie Lewis, 22, tobacco factory worker, single and living alone. Not surprisingly, given the transience and relative youth of Little Richmond’s denizens, I have found few traces of the victim or witnesses in Wilson County records. “He could not have gotten him without shooting”; or, plus ça change. Geo. M. is a police. I was standing in my house down near the Graded School, Tom ran out of the gate, Mumford behind. I hollowed at him to stop, he didn’t stop & Mumford shot him when at 50 yds. Tom was in Sarah Grants house across the street from me. Know the deceased well. Didn’t hear Mr. Mumford hollow stop, I was scared. Didn’t remember the position the deceased was running from me. Tom and I both knew Mr. Mumford was a policeman. Tom didn’t answer at all when I told him to stop, he kept on running and Tom was gaining, Tom was running and Mr. Mumford running after him. Saturday evening I went to the Station house & found the man with a ball in his abdomen 3 or 4 inches below navel. We decided from symptoms it was better to cut in & see the extent of his injury, after cutting thru the skin found ball & extracted it. Enlarged opening [passage missing] found several holes in there possibly 6 or 8, didn’t think to count the number sewed up. The deceased must have been stooping over when shot an ordinary stooping running position would cause such a wound as the deceased has. Had he been standing erect don’t think the ball would not have killed him. /s/ W.S. Anderson. Geo. W. Mumford is a policeman, his character is very good. He is one of the best policemen I have ever had. He surrendered to the sheriff Saturday evening. I signed his bond for $500.00 for his appearance. Have always considered him of a very even temperament. Dr. William S. Anderson — in the 1900 census of the town of Wilson, listed as a 55 year-old physician. Henry Claxton — married Caroline Jackson in Wilson on 22 December 1897 at age 54. Major Thomas Cousins — in the 1900 census of the town of Wilson, listed as a grocer. Warren Crank — died in Wilson on 2 June 1917; death certificate lists birthplace as Lynchburg, Virginia, in 1880; worked in tobacco factory. Patrick Bolan Deans — in the 1900 census of the town of Wilson, listed as a 44 year-old broker. W. Frank Felton — in the 1900 census of the town of Wilson, listed as a 34 year-old policeman. J.H. Garris — in the 1908 Wilson city directory, listed as a clerk in the grocery of John H. Gill. Dr. Charles E. Moore — in the 1900 census of the town of Wilson, listed as a 45 year-old doctor. George Washington Mumford — in the 1900 census of the town of Wilson, listed as a 31 year-old policeman. Golden D. Walston — in the 1900 census of the town of Wilson, listed as a 54 year-old grocer. James T. Wiggins — in the 1908 Wilson city directory, listed as a grocer. Coroner’s Records, Miscellaneous Records, Wilson County Records, North Carolina State Archives; federal population schedules, 1900; North Carolina Deaths, 1906-1930 [database on-line], http://www.ancestry.com; U.S. City Directories, 1822-1995 [database on-line], www.ancestry.com. Wilson Daily Times, 11 June 1896. 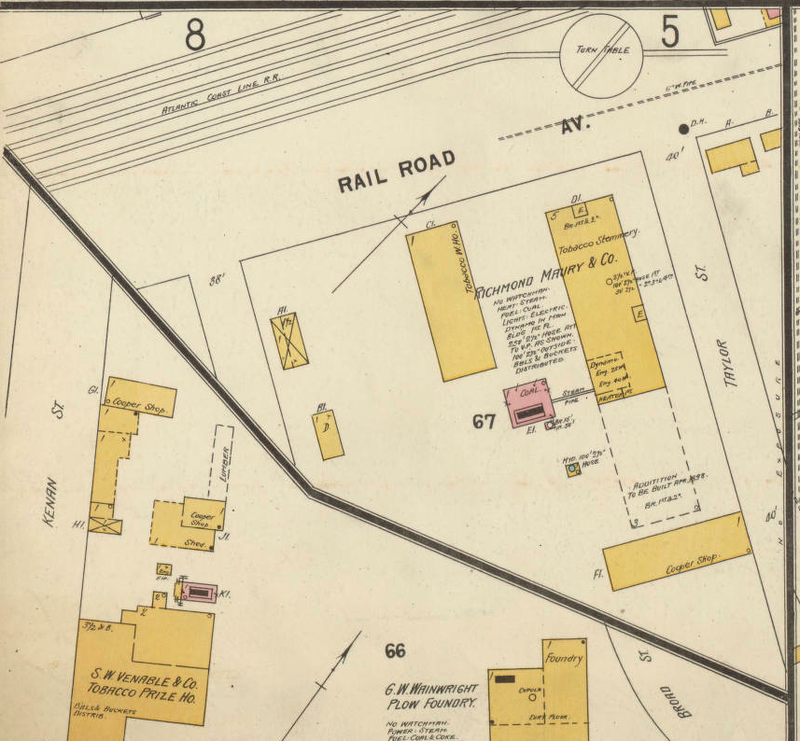 Sanborn map, Wilson, North Carolina, December 1897. Over the next four months, the company brought in more than one hundred factory hands by train. Wilson Daily Times, 14 August 1896. Wilson Daily Times, 16 October 1896. The boosterish mood quickly faded, however. Just two weeks after “a car load of 50 negroes” from Lynchburg arrived, the editor of the Times complained that Little Richmond was already a “young hell” well on its way to ruining Wilson’s reputation: “We stand and wonder at each outrage and think, well perhaps this is the climax — but instead it gets worse.” He attributed a swelling crime rate to the influx of African-Americans drawn by Wilson’s tobacco boom and urged immediate intervention. Wilson Daily Times, 30 October 1896. Richmond Maury got the hint. Blaming the problem on “outsiders” raising ruckuses, it hired a personal prosecutor to make sure that all Little Richmond residents charged with crimes felt the heavy hand of justice. Wilson Advance, 11 March 1897. Seven months later, the cutting and shooting continued unchecked. Wilson Daily Times, 15 October 1897. Thirteen years later, Little Richmond (and Grabneck, a black neighborhood north of downtown) remained a disagreeable locale to many, as indicated by concerns raised over the possible placement of passenger rail station in the neighborhood. Wilson Daily Times, 24 June 1910. So just where was Little Richmond? (Editor’s note: I’d never heard of it.) Though the landscape is much changed, the basic street grid is not, and the section is not hard to find. What’s there now? Not much. 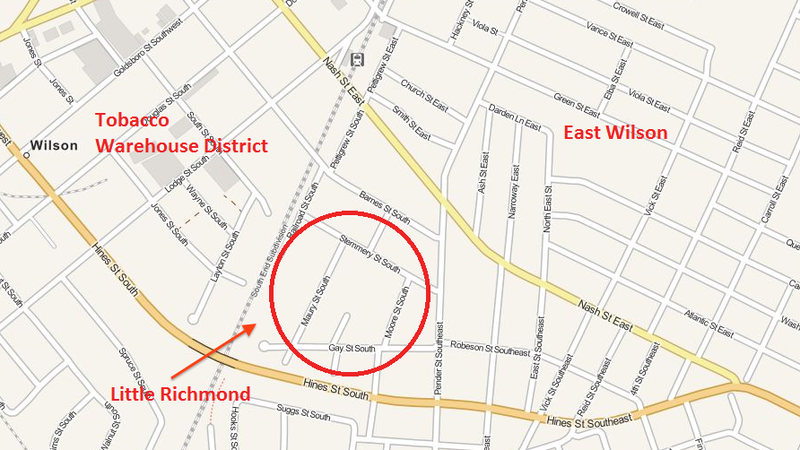 The houses of Little Richmond were clustered along Railroad and Stemmery Streets and across the tracks on Layton and Wayne Streets. Few remain, and none on Railroad or Stemmery. (The sole set of cottages left on Stemmery date from a later period.) On-line aerial maps show the factory that replaced Richmond Maury, but they are outdated. The buildings were demolished in 2013.